November was an exciting month for the city of Chicago, as Cubs fans celebrated the team’s first World Series victory since 1908. Dedicated fans have waited decades, and families loyal to the team have waited generations to see the Cubs crowned World Series champions. Through all of the ups and downs, fans have stuck by the team, collecting memorabilia every step of the way. It comes as no surprise, then, that over the years The Conservation Center has seen a number of Cubs-related works come through the doors for treatment. One such piece is a photograph of the former Cubs player, Billy Williams. The left fielder was one of the most celebrated players on the team, being named the National League Rookie of the Year in 1961. Williams was also inducted to the National Baseball Hall of Fame in 1987, and selected for the Cubs All-Century team in 1999. Yet despite all of his successes, the Cubs never reached the post-season during Williams' sixteen seasons as a member of the team. The photograph of Williams shows the player batting, and features his autograph through the center of the piece. When the photograph arrived at The Center for treatment, it had suffered fire-related damage. The piece was covered in oily, acidic soot and a layer of particulate film, and exhibited soot stains throughout. Conservators carefully surface cleaned the piece, removing the soot and particulates, and were able to rehouse the piece in a new frame with archival matting. Another photograph that was brought to The Center for treatment features crowds of people exiting streetcars, and eagerly gathering outside Wrigley Field below the stadium marquee. The image was captured on October 5, 1935, the day of Game Four of the World Series against the Detroit Tigers. The Cubs lost that game, and went on to lose the Series, but fans remained true to the team. Though those in attendance in 1935 did not get to see the Cubs win it all, fans today finally get to see the line on the marquee that has been so anticipated: “Wrigley Field, Home of the Chicago Cubs, World Series Champions”. Much like the photograph of Billy Williams, the photograph of the crowd outside Wrigley Field was brought to The Center to be treated for fire-related damage. It too was covered in a layer of soot and particulate film, and was carefully surface cleaned by The Center’s conservators using appropriate conservation methods. The original frame was cleaned and re-touched. After the photograph was conserved, it was matted with archival materials and rehoused in its original frame. 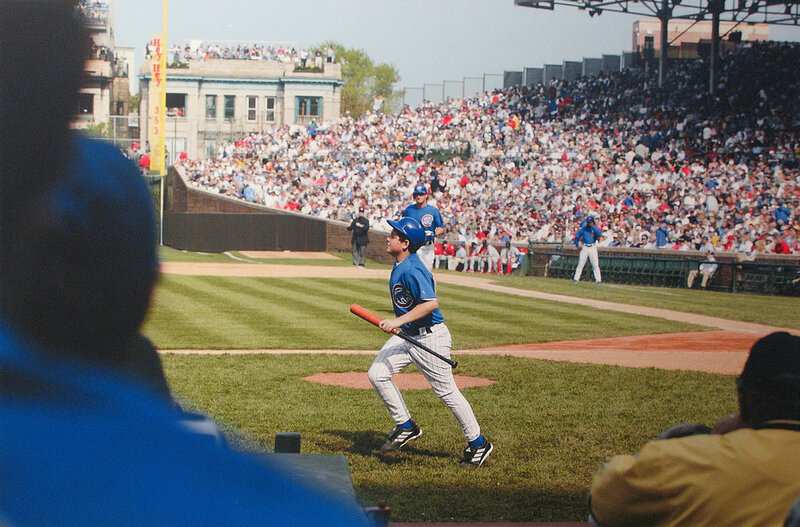 Over the years, The Center has also treated autographed photographs of other Cubs players such as Ryne Sandberg, Marlon Byrd, and Ron Santo, a photograph of a Cubs bat boy in action, and assorted historic images of Wrigley Field. Damages on these pieces have ranged from fire-related damage to water damage. Just as the Cubs were able to claim a victory after a 108 year drought, the team at The Conservation Center was able to bring these treasured pieces back to life. All of the treatments performed by The Center have helped to ensure that these pieces will last for years to come, and can continue to be passed down through further generations of loyal Cubs fans.